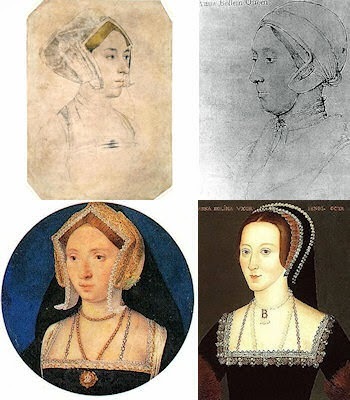 HomehistoryHistorical Reads: Anne Boleyn Portraits – Which is the True Face of Anne Boleyn? Anne Boleyn is one of the most important women in English history. She was the catalyst for the Reformation, which changed the history of the country forever. Yet, we know so little about her. We ignore her date of birth and who was really responsible for her death, and don’t even know what she looked like. The sitter’s dress – Rowlands and Starkey note that the sitter is in a state of undress and is just wearing a chemise with a furred nightgown and an undercap. They believe that “only a woman of the very highest rank could have taken such a liberty in court circles” and that it speaks of the “royalty” of the sitter. In his article “A Reassessment of Queen Anne Boleyn’s Portraiture”, Roland Hui argues that “it seems unlikely that Anne with her much commented upon sense of style would have permitted to be depicted as such” and that “to believe that Anne was goitrous (not to mention deformed by a large wart says the writer), one would also have to accept the ridiculous fiction that at her crowning she also wore a dress covered with a sinister motif of tongues pierced with nails ‘to show the treatment which those who spoke against her might expect.’ ” I have to agree with Hui, I cannot believe that a man like Henry VIII would wait 7 years and break with Rome for the woman pictured in that chalk sketch. I know that Anne was not a classic beauty but she was known for her magnetism and her style, which is sadly lacking in that sketch. In “The Life and Death of Anne Boleyn”, Eric Ives points out that Sir John Cheke, who was said to have identified the sketch as Anne Boleyn, was incorrect in several of his identifications of other portraits, so “the Cheke story is suspect”. Ives also argues against the British museum Holbein sketch and the chalk drawing being Anne Boleyn because the portrait medal of 1534, the only contemporary likeness of Anne Boleyn, shows a long and oval face with high cheekbones, features that just aren’t there in the sketches.